In the new Moroccan constitution adopted in 2011 in the context of the Arab Spring , His Majesty King Mohammed VI reaffirmed the “Hebrew distinctive characteristic” of Morocco as ” one of the age-old pieces ” of “its national identity”” and he called for “the restoration of all the Jewish temples ” in the Kingdom. In a message at the restoration ceremony of the 17th century Slat al Fassayine Synagogue in Fes, King Mohammed VI reiterated his commitment to religious freedom and spiritual diversity, and emphasized the importance of the three-thousand-year-old Jewish legacy in Morocco. 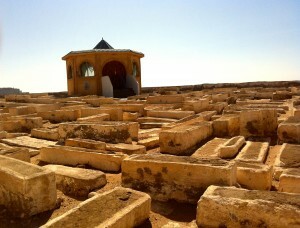 Essaouira is the site of an annual pilgrimage to the grave of the renowned Rabbi Chaïm Pinto,known for many miracles during his lifetime, he died 1845. 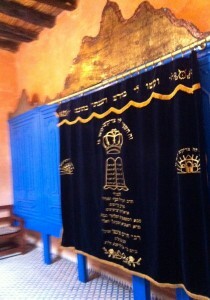 His home and synagogue are preserved as an historic and religious site. It is situated in the Mellah. 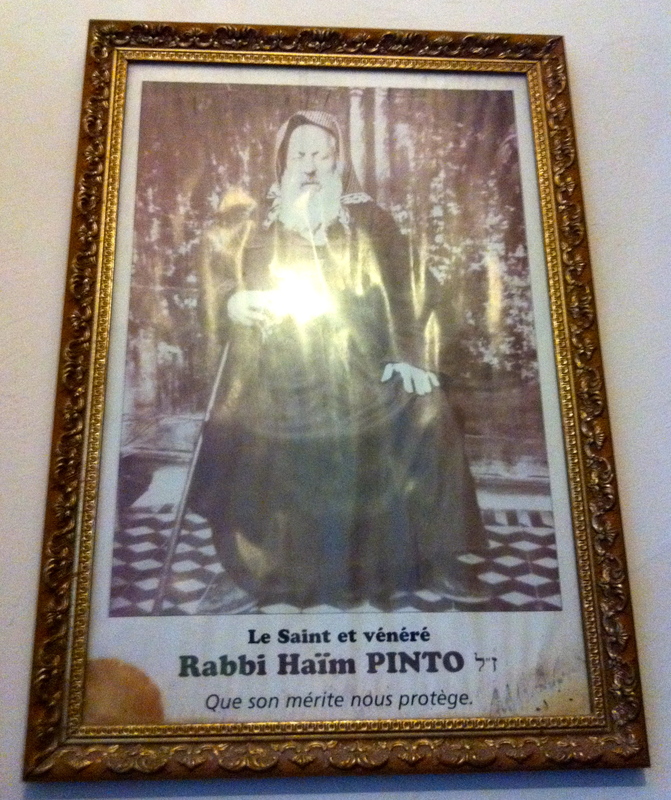 The hiloula of Chaïm Pinto is held in September every year and is attended by many devout jews from all over the world..
Essaouira’s mellah covers over 10 percent of the town, but Jews constituted almost 40 percent of the population in the late 1880’s. Jewish stars on the doors to the mellah show the degree to which Jews were accepted in Essaouira, to the point that some of the richer Jews did not even live in the mellah. Commemorative plaques indicate the buildings in which synagogues were located. The Jewish community formed an important link with the outside world for Morocco not only as regards trade but also in terms of art and culture. André Elbaz the painter is one of many, who lives in France but always remembers his birth place, Essaouira, and continues to exhibit there at the Contemporary Art Centre at Essaouira. 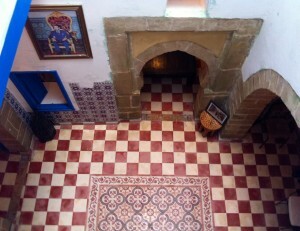 Former inhabitants of Essaouira, most of them Jewish, formed a committee to rehabilitate the town. The Jewish cemetery, just outside the city gates, is extremely well-kept. 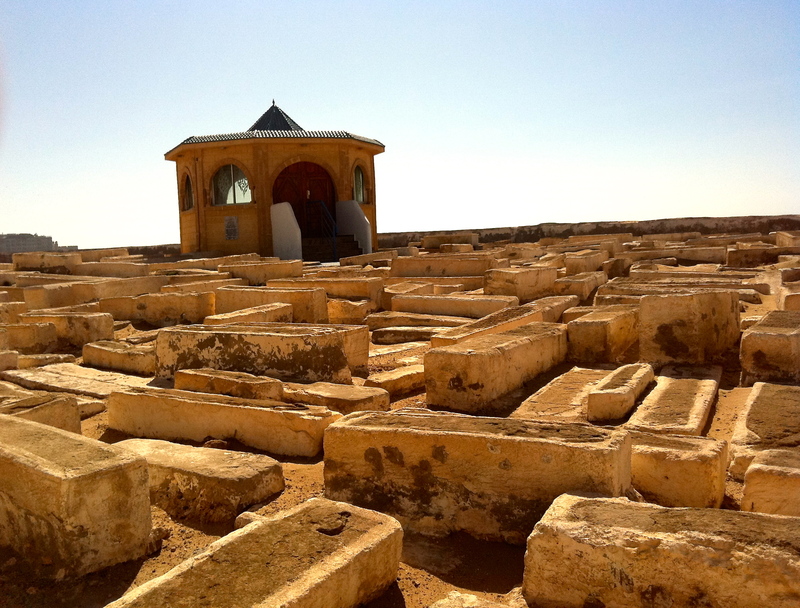 The cemetery is renowned as the site of an annual pilgrimage to Rabbi Haim Pinto. Annually, on the hillula or anniversary of the rabbi’s death (26 Ellul on the Jewish calendar), Jews from around the world come on pilgrimage to the rabbi’s grave. Essaouira was founded in 1765. The oldest tombs date from 1776. These tombs carved out of marine sandstone, are interesting. Contrary to Jewish tradition and Mosaic Law, they are sculptured with very marked human forms. The immigration trends of the 1950s and 1960s caused the Mogador Jewish community to dwindle. n the early 1970s most of its Jewish community members resided in USA,Canada, Europe and Israel. By 2005, the community had almost disappeared. Essaouira used to be an example of a small town in which Muslims and Jews lived side by side in both rich and poor districts, working together but socially segregated – and in peace. The rise of Essaouira as a commercial port in the 19th century because of the cotton trade and the links with major ports such as Manchester and Liverpool saw the Jewish community involved in export –import trade in Essaouira reach its zenith. It was unique because there were almost as many Jews as there were Muslims, so the term “minority” did not really apply, as it did in every other town and city in Morocco and everywhere in the Arab world. Aside from ownership of the land in and around the town, which always remained in the hands of the caids and makhsen – local landed gentry and royal family clans – most urban-style import-export business was dominated by Jewish families. The one exception was all artisan work connected to wood, directly linked to the vast forests around the town. From the very beginning of royal trading in the 18th century, the Corcos family dominated the import of tea leaves from Britain, which originated from its Far East colonies, and was thus responsible for making tea the traditional morning beverage in Morocco. Essaouira’s last Jews began to leave following the Six Day War. Many of the working-class families left the mellah, the Jewish district in Arab cities, for Israel. 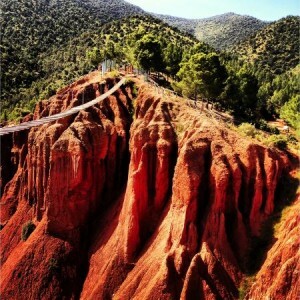 The Kasbah’s well-off business leaders headed mostly to France and Canada. 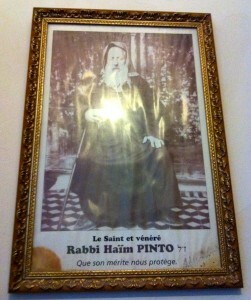 But thousands of Jews remain here, buried in two cemeteries on the edge of town, including Rabbi Chaim Pinto. Thousands of Jews return each year to venerate his tomb and those of the many Moroccan Jewish saints and ancestors uniting them with their past and also celebrating the future. 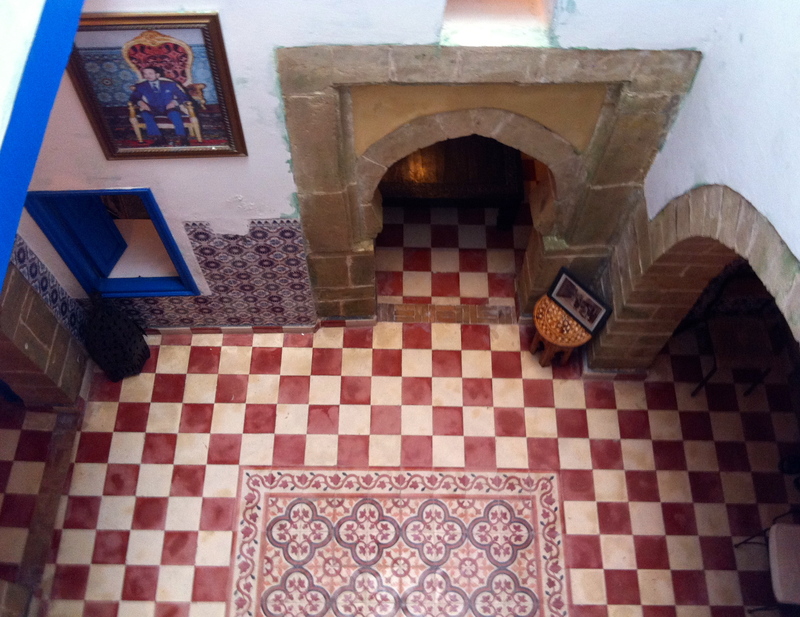 Many religious schools, a yeshiva, and several English-French Jewish schools were founded in Essaouira in the 1800s. In the early 20th century, the Jewish population in Essaouira was still higher than the Muslim population, and urban life was regulated by the Jewish calendar. Essaouira’s real beginning as a import-export center came in 1760 when the sultan of Morocco appointed families from Casablanca, Marrakech and other northern cities to settle here and become official royal traders. Many if not most were Jewish. The town grew. According to Ottmani, seven of the town’s leading families in the 19th century were Muslim, while 25 were Jewish, with names such as Corcos, Afriat, Bensaoud, Cohen Solal, Belisha, Ohana, Pinto and El-Maleh. In the beginning, these families conducted trade by ship mostly with Britain, but also handled local trade and the camel caravans coming from Timbuktu across the desert, with links to Algiers, Tunis, Tripoli, Cairo and Mecca. In modern times the caravans disappeared, but international trade focused on Europe became highly competitive. The silver jewelry work was famous for the much sought-after filogram design, the Dag Ed Essaouiri – thin lines converge on a circular center as meticulous radii, a design that was instantly recognizable as native to Essaouira. The master silversmiths were all Jewish, as were many of the workers, who lived mostly in the mellah. 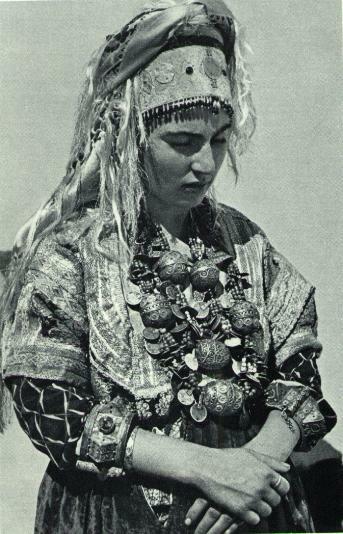 Today, the remaining silver designers are Berbers, many of whom worked with the local Jews until they left. The local Arab jewelers all work in gold. Israel has been a part of the attempt to commercialize. There is an ongoing attempt to link French-speaking Jews back to their countries of origin in North Africa. In some cases, it has been successful, as French and Canadian Sephardim, and in some cases Israelis, have bought homes there. The Essaouira Alliance Israélite Universelle School, was founded in 1765. While no longer an Alliance school, the building remains the same, with its open courtyard, narrow staircases, and rooftop view of the Atlantic ocean. In Morocco in July and August when temperatures are on the high side, you can avoid the sweltering heat of the cities by heading to coastal resorts or the Atlas Mountain retreats where cooler breezes allow you to escape inland heat. 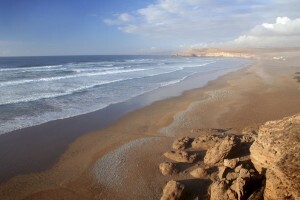 Agadir’s long clean crescent beach on the Atlantic coast, offer opportunities for surfing, snorkeling, wind surfing and jet skiing. Most of the larger hotels and surf clubs on the beach rent out water sports equipment and surf boards and cool sea breezes keep the temperature down. 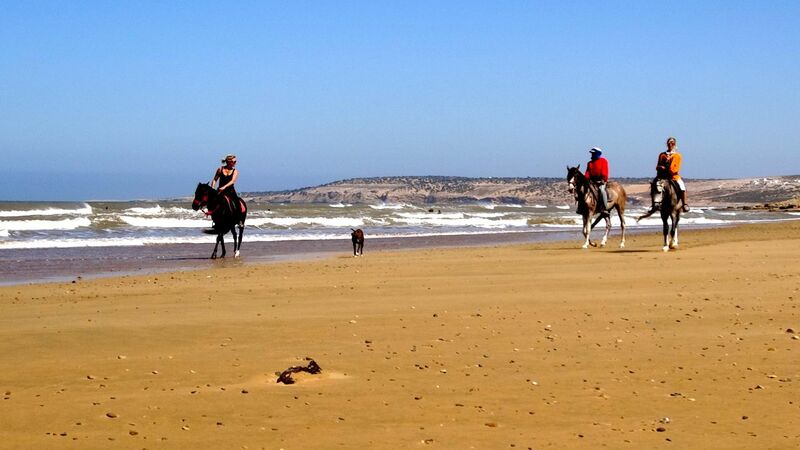 Further up the coast the ancient fishing port town of Essaouira with its ramparts, long idyllic beach and sea front, provides opportunities for wind surfing and other water sports . It has a reputation for being windy but temperatures are much lower than inland which means that you can enjoy the fun of Essaouira’s colorful relaxed souks and walk the ramparts with their 17th century cannons or simply enjoy the thriving cafe life and many good restaurants. 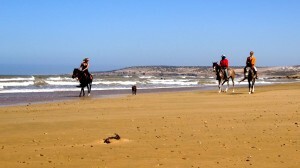 You can take a private tour to Essaouira with a Morocco travel agency which is the easiest option. Other less convenient options of travel to Essaouira is the CTM and Supratour buses offer regular daily luxury airconditioned bus trips from Marrakech to Essaouira return, which take three hours with a stop on the way at a roadside café. This for budget travelers and the way to travel if you do not have other transport arranged or the budget for a private Essaouira Tour. 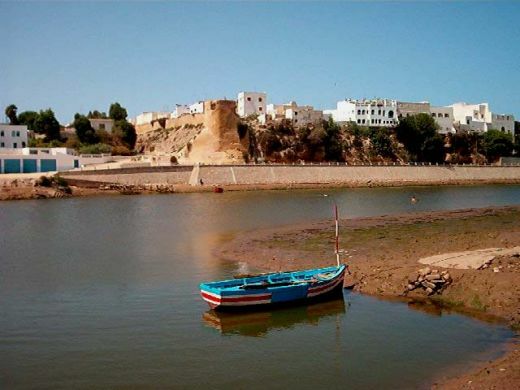 Two more relaxed alternatives to Essaouira are Sidi Kaouki some 20 kms drive from Essaouira and the alluring lagoon and beaches at Oualidia which is between Safi and El Jadida. Both locations are quiet and uncommercialised. Sidi Kaouki is a delightful small town with a few small hotels and an unspoilt beach which is also ideal for surfing and relaxing. The Hotel Villa Soleil, is a white villa with a garden and restaurant close to the beach. Other hotels along the beach are Hotel windy Kaouki, a traditional Moroccan residence and Hotel Blue Kaouki. Oualidia is becoming more popular with tourists. The lagoon and extensive beaches were a well kept secret and a favorite of Moroccans as a seaside venue and a place to unwind, the beaches extend for miles. It is a beautiful natural beach and fishing location where surfing and swimming in the shallow waters of the lagoon can be enjoyed by all the family. It is ideal for swimming, surfing, wind-surfing or water-skiing. You can also hire a kayak and explore the lagoon or go fishing. There is a French run surfing school for children and beginners. Oulalidia is a very important ecological location. Among the marshes and wetlands there are curlews, flamingos, sandpipers, plovers, and many other migrating species making it a paradise for bird watchers. It is the main place in Morocco for oysters and you can enjoy them and the best seafood in the restaurants and small hotels along the beach. The most luxurious hotel is the luxury boutique hotel La Sultana Oualidia situated on the edge of the lagoon. It has an infinity pool ringed with jacuzzis, whose waters seem to merge with those of the lagoon, and an exotic, terraced garden as well as a five star health spa and an underwater restaurant. Alternatively you can drive to the Atlas Mountains to places such as the trekking town of Imlil and the Shangri la setting of the Kasbah Toubkal surrounded by mountains with outstanding views from its terrace. You can experience the life of the Berber people and the cool clear air of the mountains. Even a trip to the Ourika Valley with its bubbling streams or further up to the seven waterfalls of Sebti Fatima which leads on to trekking in the mountains. The ski station of Oumkaimeden offers views over the Vale of Marrakech. Other mountain locations include Midelt, Ifrane and Azrou which are high up winter stations and offer a cooler temperate climate with forests and national parks to explore. Even when you are in Marrakech, you can find a shady spot in the eco paradise of the Majorelle Gardens owned by Yves Saint Laurent or the green palm tree lined Moulay Abdesalam Park off Avenue Mohammed VI or the delightful Harti Park near the Place 16 Novembre and Macdonalds which has a children’s playing ground with two large stone dinasours. You can take the family for the day to the Oasiria Water Park just outside Marrakech,or the Beldi Country Club 6 km outside with its adult and two children’s swimming pools, Spa and three restaurants, set in fine gardens with roses,olive trees and flowering plants. This is also an hotel and the club serves non guests. For the seriously trendy there is Nikki Beach in the Palmeraie which has a DJ with groovy music as well as an excellent restaurant and swimming pool. Many hotels and some restaurants in Marrakech now welcome guests and nonresidents for lunch and a dip in their pool. Lamps in ornate brass covered with intricate designs thrown into relief as shadows on the wall, huge lamps hanging from the ceiling, framed wooden Arabic calligraphy and the finest metalwork hangs on the walls of Yahya Rouach’s show room in Marrakech’s modern quarter, Guéliz. 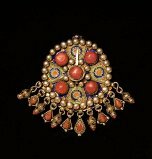 It feels as if you have entered the splendors of the golden age of Islamic art with the clear precise lines of modern design. It has the western elegance and economy of style as well as the richness and exuberance of the East. There are silver nickel boxes and superb wooden creations using Arabic geometric and floral Moroccan designs and calligraphy. Elegant proportions, subtle imaginative and effective use of light, sobriety and richness of design, nobility of materials and a jeweler’s meticulous precision characterize the work of Yahya Rouach. He was born in London in 1972 and his father came originally from Meknes, his mother is Anglo German. He came over to Marrakech in 2005 with his wife and six children from London after an earlier visit in 2004. 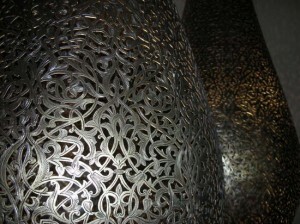 He was fascinated by the brass work and silver designs he saw in the souk. He began by exporting artifacts to London and started drawing and experimenting with his own designs, he was having fun and then he began to take it seriously. Yahya’s creations are a mixture of East and West. He was selling his work to Harrods and other outlets and night clubs in London and Nieman Marcus a US company which gave him his first substantial order that really set him up. In six weeks he ran out of stock and realised the importance of taking time to create artistic excellence, so clients were encouraged to come to him rather than the other way round. He works strictly to order due to demand. He is entirely self taught and had no formal training. He does what he likes and each creation is entirely original. Each piece he creates from the smallest to the largest specially commissioned works of art becomes a collector’s item transcending time and fashion. He is driven by his passion for design and creative imagination. Yahya Rouach selects young craftsmen and trains them.To produce such treasures he needs highly qualified and creative staff. The process is different from the craftsmen in the souk because their work is essentially repetitive whereas Yaha Rouach is drawing out the abilities of our people so that they create original work. He does not believe in pushing people beyond their limits but he encourages his workers to extend their abilities and this works. Yahya has his workshop in Sidi Youssef with two hundred craftsmen. The work is intricate and takes weeks and months of dedicated work to complete, hammering and chiselling the brass or nickel silver or wood with the delicate patterns that start their life on paper. Often more than one craftsman works on the design and it becomes a team effort. It is not something that can be rushed and his clients know this, so they are prepared to wait because perfection such as this cannot be mass produced to order. 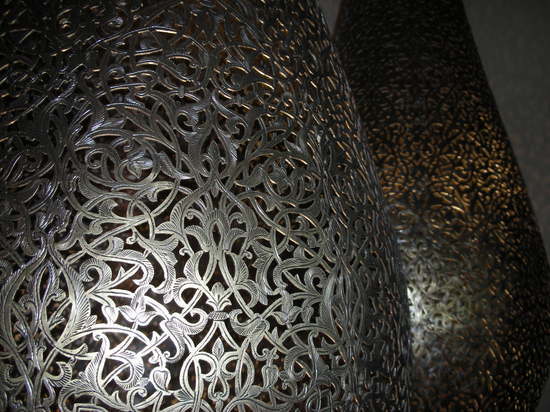 Yahya is well known for his metal work. His team design and create collections that are diverse in terms of materials and style using glass, wood, stone and fabrics. 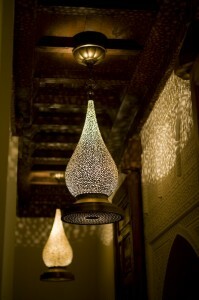 From lighting and furniture through to decorative accessories and objet d’art. He is always exploring new materials and forms of artistic expression in order to develop his style and vision. Many royal families and important personalities in the Middle East particularly like Yahya’s work and he has many clients in the United States and Europe and of course Morocco, so he has an international clientele for whom we we work on private commissions. He won the contract to provide leading pieces and decoration for the Royal Mansour Hotel in Marrakech which is owned by His Majesty King Mohammed VI. Yahya does not normally work for hotels but this was special and a great honour. They gave him a completely free hand on what his team did for the project and it was a fantastic project to work on. Yahya Rouach’s clients know his work and come to him when they want something special, of the highest quality and totally original. Each project Yahya’s team works on is unique and has its own special ambience. Morocco’s pottery and ceramics are one of the real treasures of the souks with diverse traditional and modern colors and designs influenced by Berber and Islamic art and before them, absorbing Phoenician, Roman and Byzantine designs. Ceramics and pottery pieces include vases, plates, pots, dishes, bowls, and the funnel shaped tangines used for slow cooking stews. Be sure to distinguish pottery used for cooking from ceramics used for decoration, because the glazes used to fix colors include lead and cadmium. It is not unusual for there to be several glazing and several firings on a particular Moroccan piece. The final product is vividly decorated and water-resistant due to the glaze. Artisans carry on centuries-old traditions in their designs are passed on through families. The three main pottery centers are Safi, Fes and Meknes. Safi is by the far the largest production center where apprentice workers kneed the clay and skilled artisans create the shapes out of the sun baked clay on the potter’s wheel. Designs are etched on the wet clay and dried in the sun. They are then fired in kilns to evaporate the moisture from the clay, cooled and then decorated with colored glazes which make them water resistant. 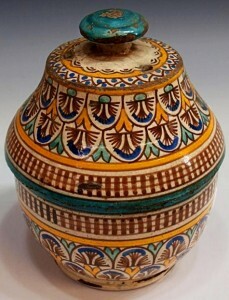 Pottery from Safi is known for its metal inlays and is often made of red clay and glazed in green, turquoise and black. Potters throughout Morocco also use modern multicolored designs as well as traditional patterns. If you visit Safi you will find the Quartier des Potiers or Potters’ Quarter near the Portuguese fortifications known as the Kechla and the National Ceramic Museum, which is in the Kechla. It displays the typical pottery styles throughout the country, and, from the walls of the fort, you can see the potters’ hill, with potters at work at their kilns. Master potter Moulay Ahmed Serghini also has a studio in Safi, where visitors, including children, can take lessons in ceramics workshops. Serghini’s work, which has been displayed at the British Museum, is also for sale throughout the city. The ancient city of Fes offers uniquely designed and colored Moroccan ceramics with an Islamic influence in an intricate patterns, colors, design and production. For over six centuries Fes created the finest Moroccan pottery. Its beauty comes from the complex knowledge of geometry passed on from father to son. The Fes Potters’ quarter is east of Bab Ftouh on the road to Taza. At the Poterie Fakh-Khari there are two pottery shops and you can watch the production process from kneeding the clay, spinning on the potter’s wheel, firing in the kiln, glazing and finally the finished product. Due to the variation in the glazing process no two pieces are exactly alike. 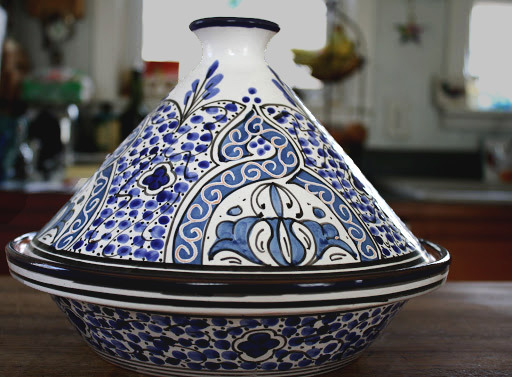 Fes is renowned for the choice of cobalt oxide that gives the pottery its distinctive shade of blue. Some Fes and Meknes potters moved to Safi in the 18th century to take advantage of its rich clay deposits. The floral and geometric Moroccan designs are available in cobalt blue and multi colored. This highly decorative ceramic style was greatly influenced by the Moorish Andalusian period when the moors and the jews fled the Reconquista in 1492 and settled in Fes. Antique blue and white fassi pottery pieces appear in museums such as the Marrakech Museum or the National Ceramic Museum in Safi. 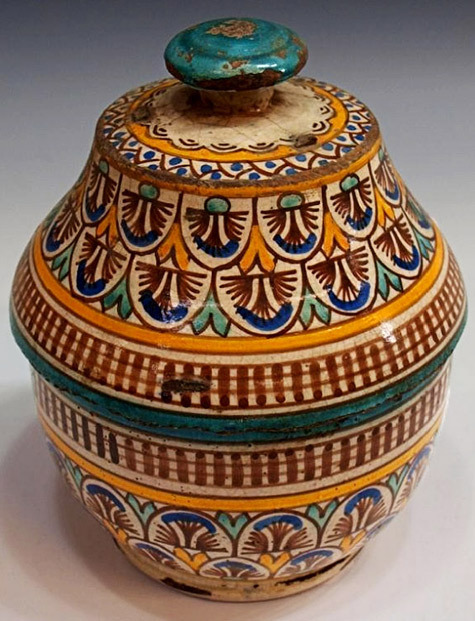 Many tribes fashion their own styles of decoration for their pottery with designs created over two hundred years ago. Learning some of the basics of Moroccan cooking can be an enjoyable experience and adds to your own culinary skills back home. Many riads offer cookery classes for their clients during their stay. 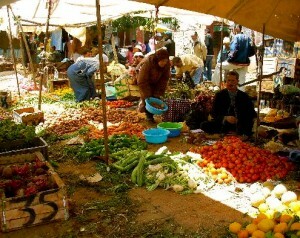 These usually begin with a trip to the souk accompanied by one of the staff to buy produce and spices. In contrast to shopping at home everything is bought fresh, for home-cooking. The market stalls include piles of spices, and fresh fruits, nuts and fine local vegetables all beautifully laid out with the fragrance of mint and cilantro . Shopping in the souks of Morocco is a keen sensory experience, as well as a chance to experience local daily life as buyers and sellers haggle over prices. 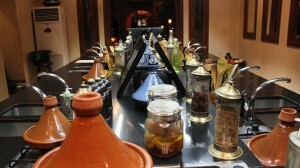 Learning how to use spices is a key element in Moroccan cuisine. Salt, pepper, ginger and turmeric are essential to many tagines and stews. Make sure you pick up plenty of ras el hanout(the best spices in the store) so that you can cook up authentic Moroccan dishes back home, and consider stocking up on saffron too. Charmoula is a popular Moroccan sauce that can be used on everything from fish to vegetables. Coriander and cumin are the leaders of the spice mix. The spices are ground with garlic, and freshly squeezed lemon juice. Spices and pepper can be added for taste to suit individual preference. 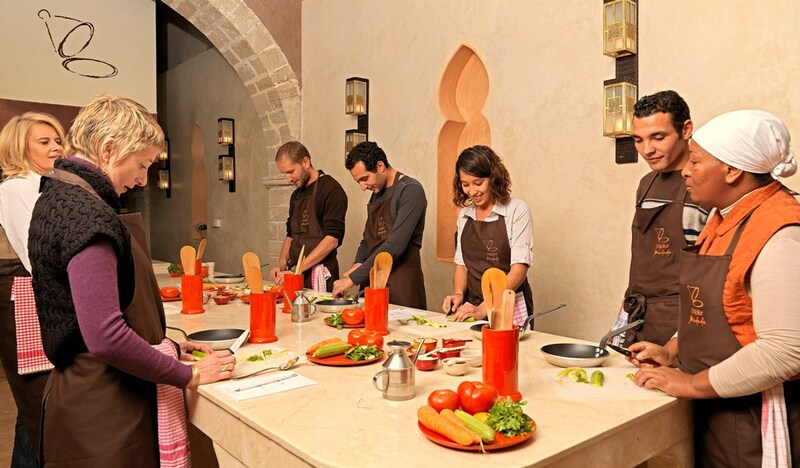 When you return from the souk you can begin the cooking class under the instruction of an expert chef. Each person in the group is allotted specific tasks in the cooking process and a after a lesson or two you should know how to dress a salad, create a main course and a desert. Longer intensive courses are available and your travel agent should be able to advise you on this. 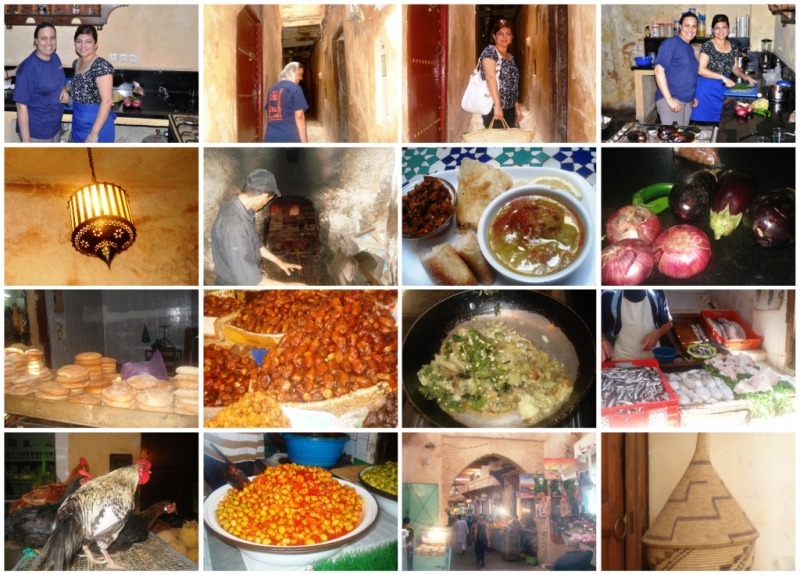 Learning to cook in a Moroccan kitchen gives you a unique insight in to family daily life. Finally you get to sample and enjoy your joint efforts over lunch or dinner. Some examples of Moroccan dishes include tangines, slowly cooked meat and vegetable dishes in a pot with a cone shaped lid that gently cooks fish, beef, dried fruits and olives. Vegetarians can enjoy vegetable tagines. Other recipes include lamb with prunes and almonds, chicken with lemon and fruits are blended with meat dishes such as lamb with pears. You can learn how to make couscous, which is small grains of semolina which is steamed and eaten with a spicy broth and vegetables and meat. Moroccan families gather after Friday prayers to get together over a couscous. Harira is a renowned traditional soup made with tomato paste lentils, chick peas and spices and sometimes pieces of lamb. 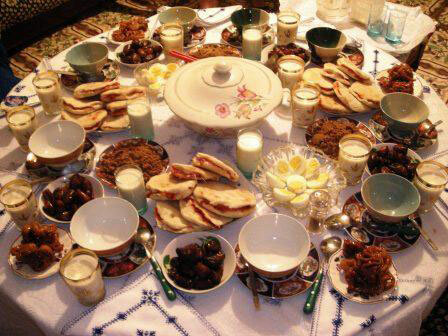 It is served with dates when Moroccans break their fast during Ramadan. Moroccan salads can be served as a starter or as a side dish and orange blossom water is sometimes used in salads. Moroccan cuisine has strong aromatic qualities. The Al Fassia restaurant in Marrakech serves several dishes of salads as a starter and to appreciate the art of salad making and superb tangines it’s a wonderful place to experience the very best in Moroccan cuisine before you start your own efforts. Other dishes include Bastilla which is pastry dusted with cinnamon and stuffed with sweet and savoury ingredients including pigeon. It can be served as a starter of a main course. Birouettes are small triangles of pastry with savoury and spicey fillings such as minced lamb or fettah cheese with spinach. It can also be a dessert with groundnuts and honey. Moroccan pastries are served with honey . Learn to bake Moroccan bread which often has added spices and how to make Moroccan mint tea to accompany the meal. La Maison Arabe – A long standing name in Marrakech for it’s restaurant and boutique, luxury Riad, La Maison Arabe boasts one of the most professional and detailed cooking classes in Morocco. Headed by a Dada Chef guests experience a stroll through the souks, learn how to purchase spices, then cook up a three-course meal. 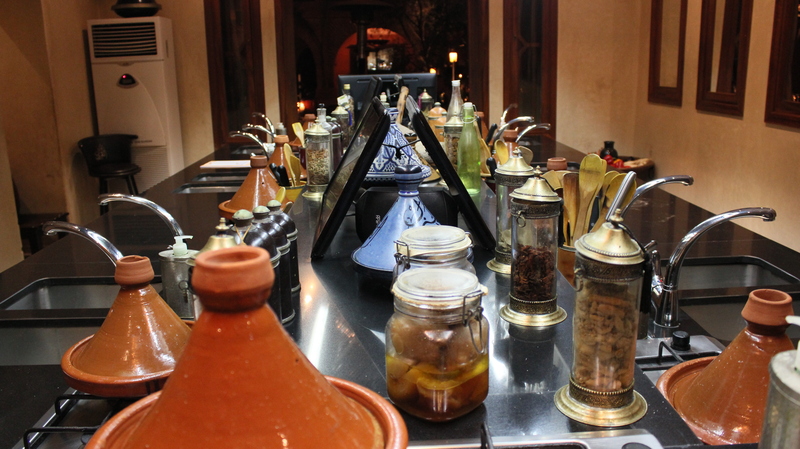 Options of wine pairings to match and everyone departs with a complimentary tajine. 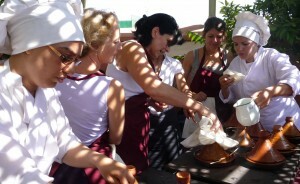 This is the cooking workshop for professionals and also for those who love the art of cooking. Riad Monceau – Haute Cuisine at this French owned Riad and cooking class is what can be prized most. An elegant and charming setting within old Marrakech’s Red Hamra city Riad Monceau’s owner Ludovic Antoine offers guests a top notch class. With their widely esteemed cook book, local chef and hands on approach this is a great way to discover the art of Moroccan cooking in Marrakech. Cafe Clock – Set within the old Fes Medina just down the street from Maimonides is the ever so hip and charming Cafe Clock. Cafe Clock allows participants to select their own menu, then takes them on an authentic shopping expedition in the Fes souk where you choose your own ingredients, learn about bread baking and other details of Moroccan cuisine. Cafe Clock offers a Moroccan bread baking workshop or a one-day patisserie class. Complimented by their cafe which is an active place for locals and foreigners Cafe Clock serves one of the most exciting cooking workshops in Morocco. L’Atlier Madada Mogador – In Seaside Essaouira this fabulous cookery workshops is perfect for small groups who collaborate together in a charming Riad near Morocco’s seacoast. They prepare a full meal before sitting down together to dine in a traditional setting. A walking tour option in the souks after is a nice add on to this day. You are currently browsing the Travel-Exploration Blog blog archives for July, 2013.